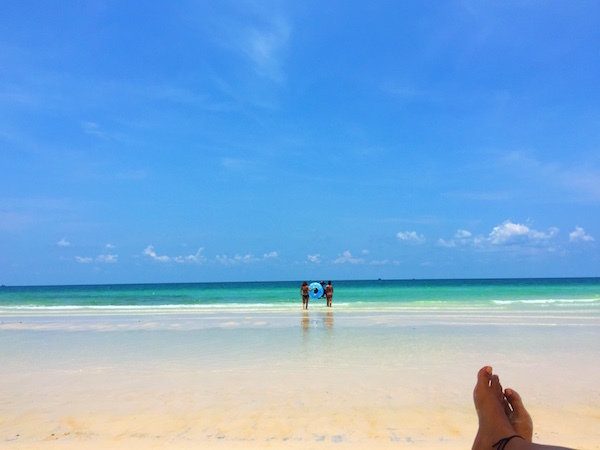 Im a self-confessed island addict, so when my friends suggested going to Vietnam for a vacation, I knew I had to find the most pristine beach & sea situation I could. 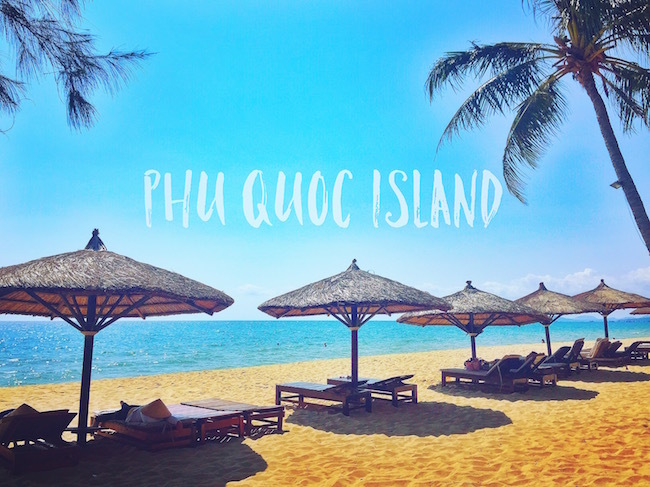 Phu Quoc is a gorgeous, tropical island off the southern tip of Vietnam, right beneath Cambodia, famed for its clear turquoise water, fine sand & fish sauce factories. 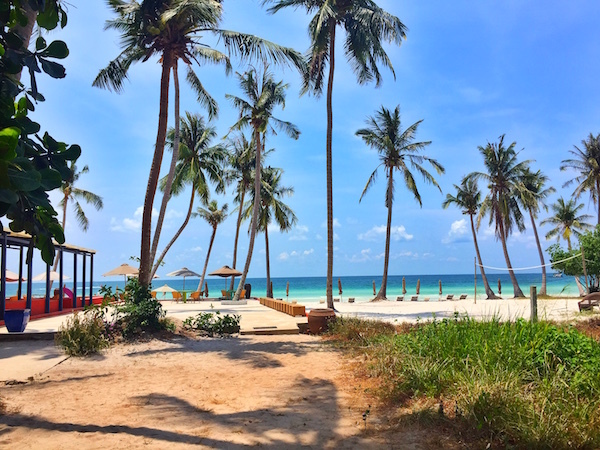 I was here in late April with 2 of my girls for a much needed week of rest & relaxation, and was pleasantly surprised with this little chunk of land in the Gulf of Thailand. 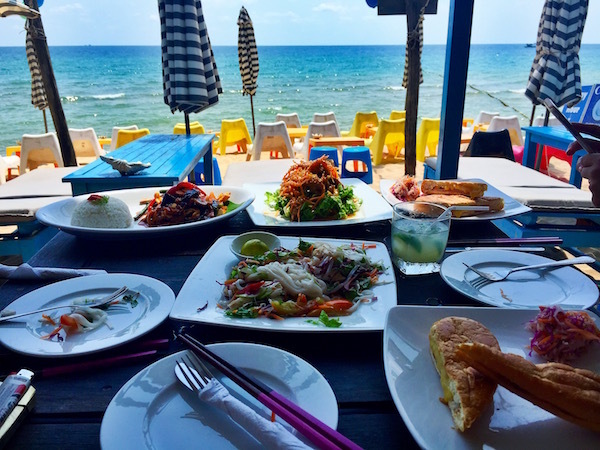 Apart from beautiful beaches, the food is fresh & delicious, the locals are friendly, and all in all it’s not super heavy on the wallet. If you find yourself in this tropical getaway, then there are certain things you must do. Here’s my list for a perfect week of sun, sea and smiles! It’s not really called long beach but I feel like every island I’ve been to in southeast Asia has a long beach of their own. It’s basically the longest & busiest stretch of sand on the island and the area/town is called Duong Dong (not kidding). Home to all the great resorts, restaurants and entertainment, this is the safest bet when picking a location for accommodation. Okay so the water isn’t AS blue as other parts of the island, but its still gorgeously clear, warm and all you need for a refreshing dip. Taxis are easily available to take you to beaches around the island, and it’s great to be able to stroll to dinner or drinks each night without worrying about transportation or whose going to be in charge. You can’t rent cars in Phu Quoc as a tourist, only bikes (scooters), which aren’t the safest to be driving around on in the dark on winding roads, so please don’t ever think of drinking & driving unless you have a death wish. Staying on this busy stretch provides plenty of options after you come back from a long day at one of the pristine beaches. We were at Arcadia Resort, which I would highly recommend. Gorgeous porch situation in our beach bungalow. I believe this is one of the only spots that really stays open late, unless you go to local clubs where the crowd is only Vietnamese and the music is reminiscent of something you’d hear in a tacky karaoke bar. This is a very casual spot along Long Beach with good food, drinks and tables out in the sand. Perfect spot to watch the sunset, for drinks after dinner, or to get a little crazy on the small, sandy dance floor after a few too many espresso martinis (dangerously good). We ended up here almost every night, not only because our hotel was a 2 min walk away, but also for the fun, friendly & relaxed vibe of this place. Probably one of the most famous beaches on the island, it’s easy to see why people from all over flock here to find a shady spot for the day. 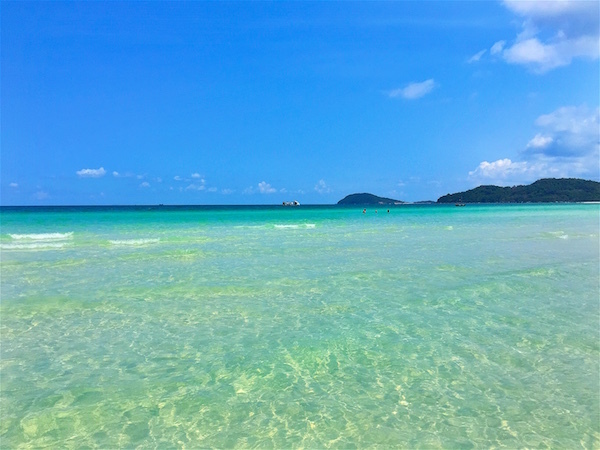 Its a halfmoon, bay kind of shaped beach which means during good weather the water is as calm as a swimming pool. It’s shallow for quite a long time, perfect for families with children or anyone else who prefers to float over going for a strenuous swim (me!). All the shades of blue are mesmerising and the sand is soft enough to powder a babies bottom. 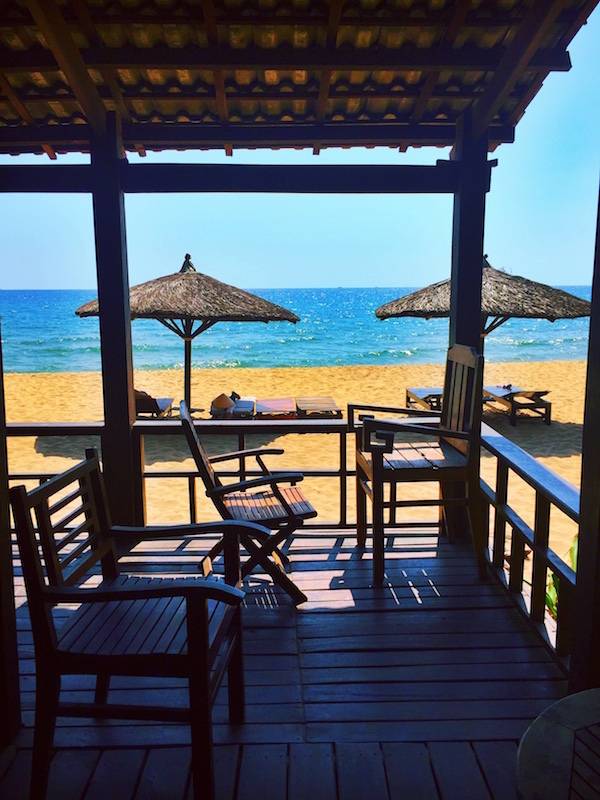 There are plenty of beach shacks offering fresh seafood, cold beer & refreshments along with sun beds for a small cost. I suggest walking to the much quieter far left of the beach (if you’re facing the ocean) and renting a sun bed from one of the sweet fellows there for a fraction of the cost compared to the busier beach front restaurants. They don’t have food here (so eat before or after), but the bed rental guy has an icebox full of beer, water & coconuts, which is really all you need. 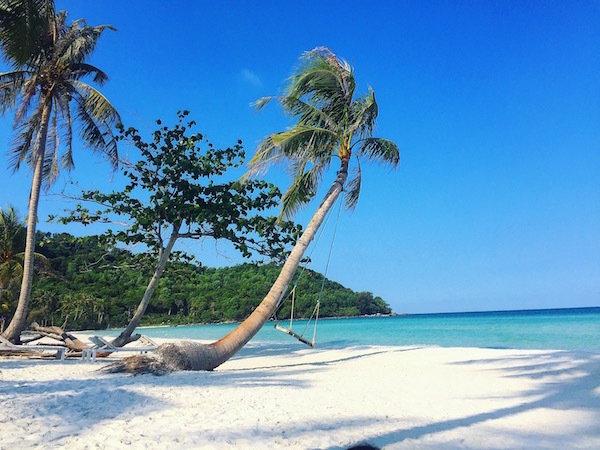 There’s also a picture perfect tree swing hanging off an especially tilted coconut tree and you can get on for about $1. 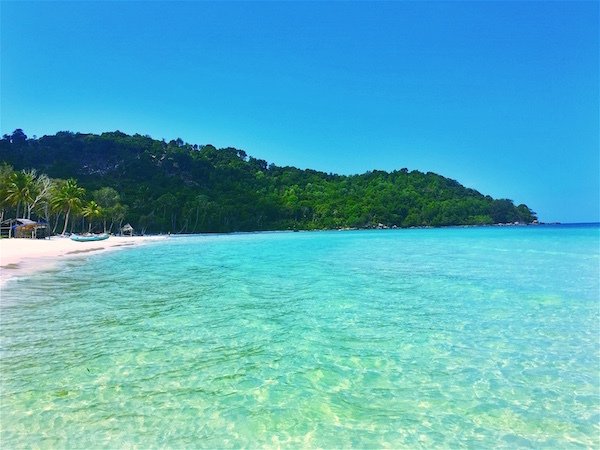 Walking towards Bai Sao and the color of the sea just hits you right away! Blue as far as the eye can see. Afternoon refreshments. 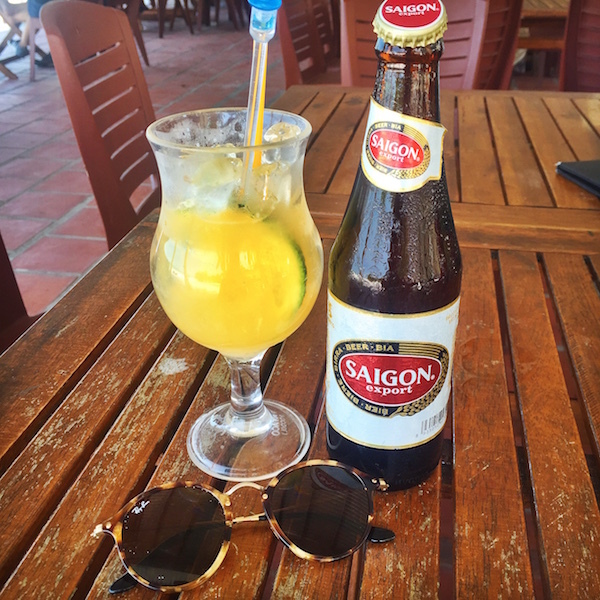 Saigon Beer & fresh orange juice. Need something to slap you awake in the morning, or in the evening after napping on the beach the whole afternoon? 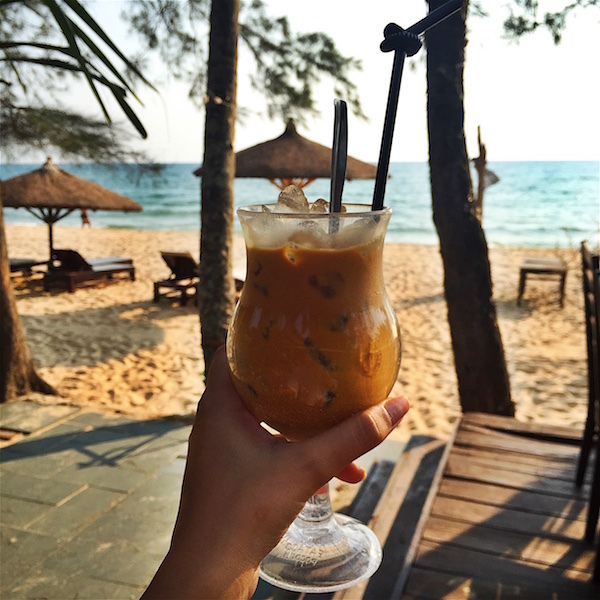 Look no further than the very famous iced coffee from this country. Made with a thick coffee concentrate, which is poured on ice with condensed milk and served in a tall glass. I prefer adding a little fresh milk too as its pretty strong otherwise, but its definitely the best iced coffee I’ve ever had. None of that watery, not strong enough crap, this stuff is potent and flavourful. I suggest one with breakfast and one late afternoon. While the visibility isn’t as good as certain other places in the world, it’s still a fun experience to see some of the underwater life and also to be out on a boat for the day coasting around the shoreline of the island. 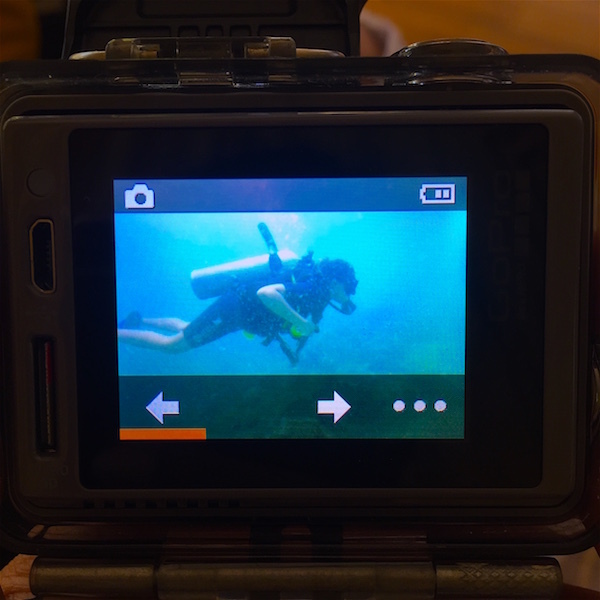 Since I have my PADI certification I decided to do 2 dives one morning while my friends snorkelled above me. We chose Flipper Diving Club, a very good professionally run company that provided pick up & drop off, as well as lunch on the boat. The only thing you do need to be careful about is the jellyfish. Much like the Mediterranean Sea in the summer, Vietnam too has a bit of a jellyfish problem during warmer months. While you won’t die from a sting, it certainly hurts and leaves a red mark for a couple of weeks. Be wary when swimming in Vietnamese waters, overfishing has led to an imbalanced ecosystem where jellyfish thrive. Just keep your eyes out for them though and you should be fine. 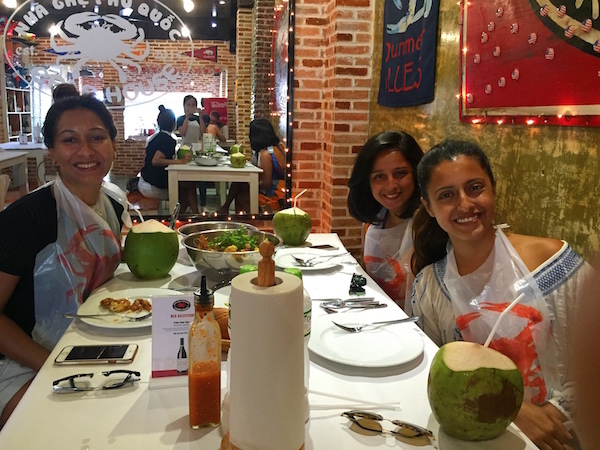 Probably the best meal we had on the island, this fuss free spot serves crab and seafood in a variety of sauces with accompanying sides. 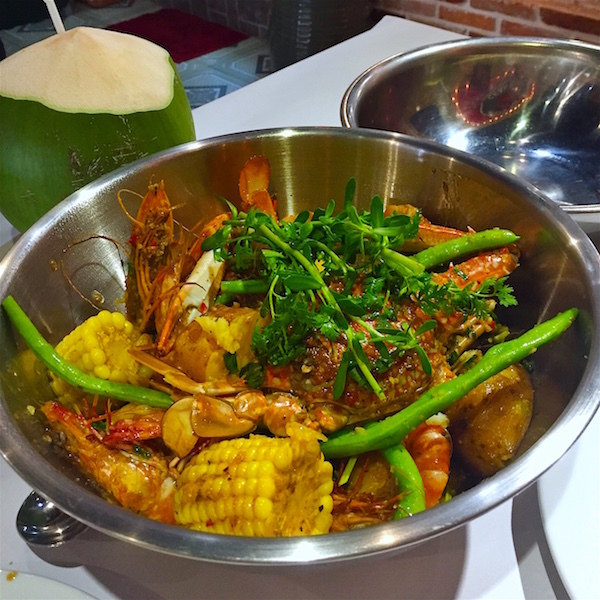 Try the big sharing bowl which comes with a couple of crabs, a whole lotta king prawns, corn, potatoes, and greens all cooked together in a giant pot with the sauce and spiciness level of your choice. We went for the house sauce with medium spice and sucked it all down with some fresh coconut water and bread. Pro tip- throw chunks of bread into the base of the bowl so it can soak in the sauce till the end. You’re welcome. Happy girls at Crab House! Luckily for us we had massage ladies right outside our beach bungalow, and we would diligently go to the them for an hour long full body rubdown every single day. 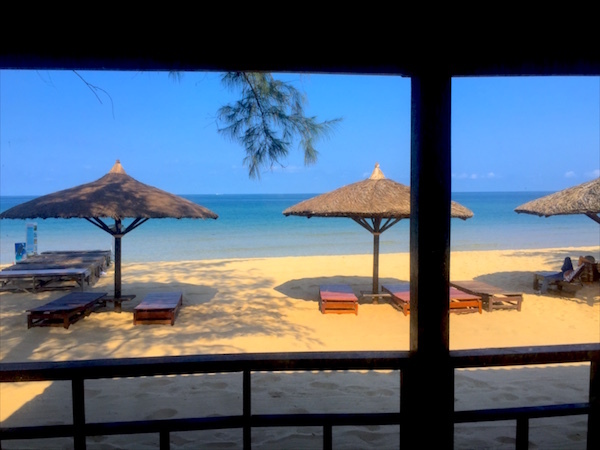 The have shaded beds set up on the beach, prices are reasonable and their hands are strong and talented, kneading out even the tightest spots on the body. Not to mention the sound of waves lulling you into a coma at the same time. Get a massage, drink an iced coffee and think about how sweet life is on island time. The sweet little massage ladies on the pink beds. There’s something about waking up early, having a good breakfast and laying on the beach that just spells out perfection. Early in the morning the water is the calmest it will be the entire day, and sadly I only discovered this on my last day there (I’m not a morning person and love my sleep). When I did finally decide to wake up around 7 am one day, I jumped into my swimsuit and straight into the sea for one of the best swims of my life. The water was glasslike, with not even the smallest ripple on the surface. The beach was still quiet since it was early, the sun was shining, you get the idea. I was kicking myself for not doing this every single day that I was there, so do yourselves a favour and wake up early the first morning you’re there and I guarantee you will be waking up early every day. 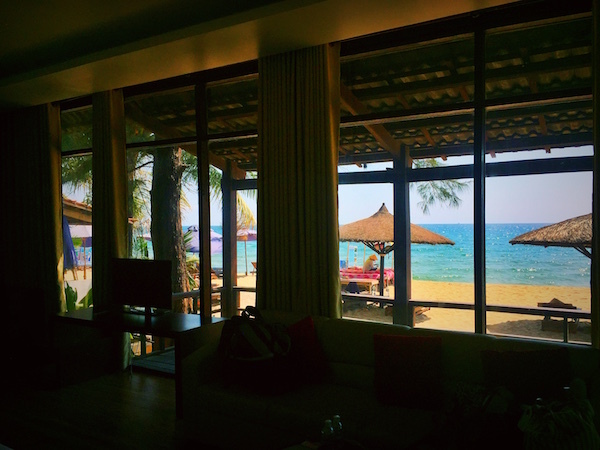 You can always eat breakfast afterwards and go back to bed for a few hours, but the sea will never be as calm as it is during that time of day. This was taken around 9 am, so there was still a little movement in the sea. 7 am is ideal. 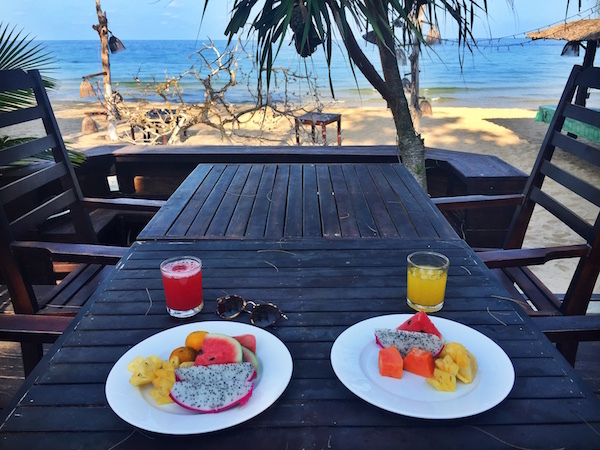 Breakfast of fresh fruit after a swim. 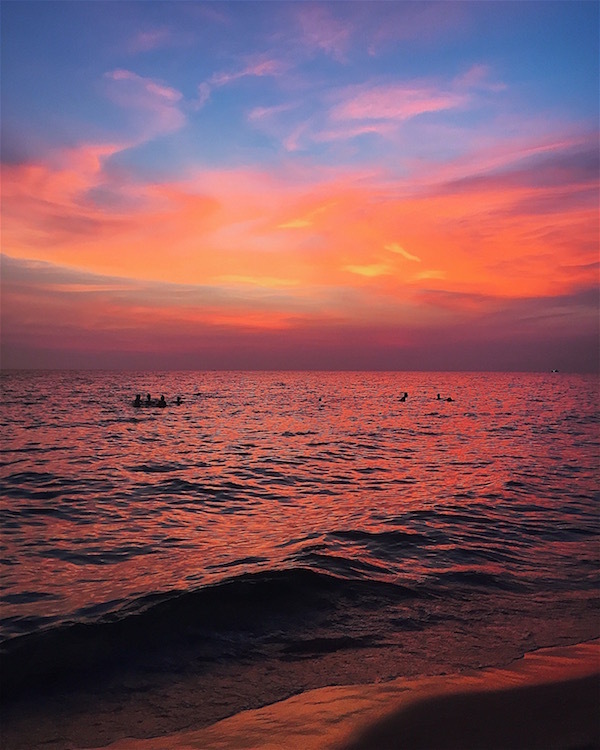 Luckily Long Beach is on the sunset side of the island and is the setting for some truly incredible pink-orange-red-purple-blue skies. I would suggest heading back from whatever beach you’re at and parking yourselves on long beach for magic hour. Add a couple of cold beers and a little snack of bahn mi sandwiches, and the evening really could not be better. A sunset swim adds extra magic. Partly cloudy evenings make for the most breathtaking sunsets. turning the sky & the sea into a flame coloured masterpiece. Will never get over this sunset sky. With water this calm, there’s only one supremely relaxing way to enjoy it, and that’s floating on your back with not a worry in the world. All small shops sell inflatable beds and floats of all sizes, make sure you inflate it and test it out for any holes, because they will not exchange anything once its sold. So what if you look like a 5 year old on the beach? 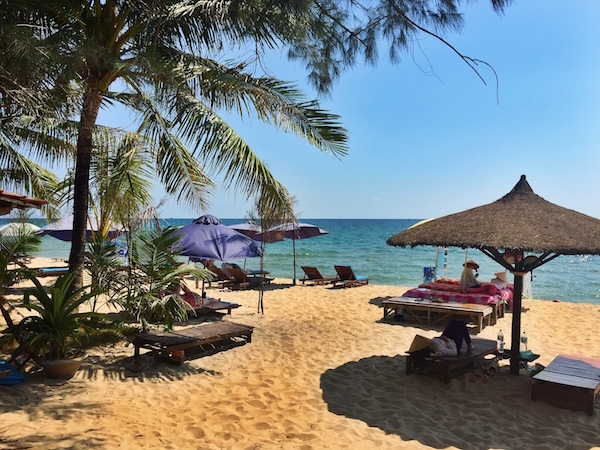 Secretly everyone’s jealous of your ultimate chill plan, plus no stress of swimming into any jellyfish (Long Beach and Bai Sao have netted off areas to swim if you’re nervous). Just bob around to your hearts desire. My friends even brought their floats back to Bombay for memories of blissful times spent upon the sea. My girls and their floats.